Aubergine and Potato Curry- a spicy, tomato-based, vegan curry with aubergine, peppers and potato, very low in calories and syn free on Slimming World. It's my mission to find as many different ways to use aubergine as possible. 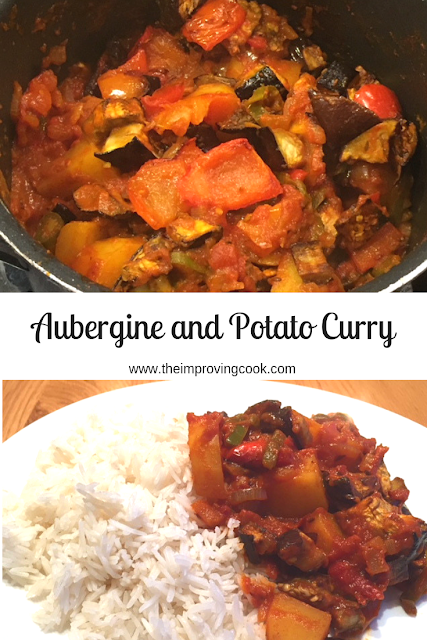 Pretty much anything tastes better with aubergine in it, in my opinion! We are still going strong with our attempt to do a full year of Meat Free Mondays and aubergine has been a key ingredient for getting us as far as September successfully. 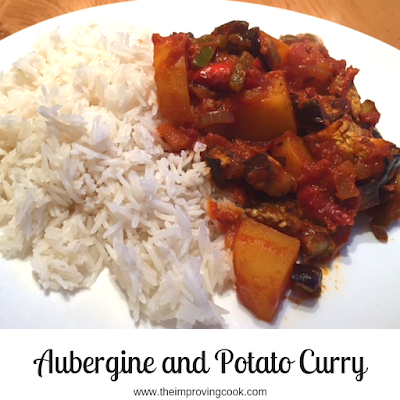 This recipe for Aubergine and Potato Curry, is up there with my favourite spicy meals. It's absolutely packed with flavour and deliciously spicy. Of course, if you're more of a mild spice fan, just adjust the heat of the chilli powder and/or reduce the amount of fresh chilli that you use. 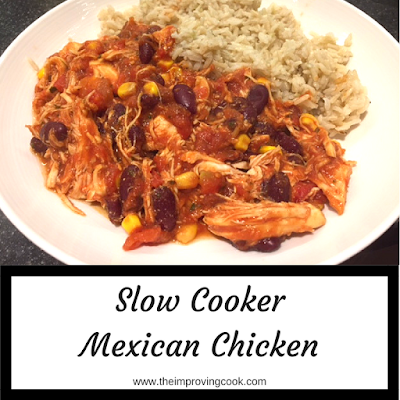 For full details, including nutritional information, you'll find a printable recipe card at the end of this post. Chop the onions and slice the chillis. On a high heat, pan fry them in olive oil (spray oil if doing Slimming World), along with the cumin seeds, paprika, garlic and chilli powder. Listen out for the cumin seeds popping! Chop the aubergine, peppers and potatoes. Pop the aubergine and peppers in the oven on a baking tray to roast so you get that gorgeous nutty flavour. Add the tomato puree and tinned tomatoes and stir through. Add the potatoes and then add the boiling water. Stir well. Don't panic if it doesn't taste of much at this point, the flavour will come surging through as it reduces. When the liquid has reduced and the potatoes have cooked through, you should have a thick, spicy sauce. Add the roasted veg and mix through. Allow to reduce a little more, but not so much that there's no liquid. 1. Preheat the oven to 210 degrees C (190 fan/gas mark 5). 2. Prepare the veg- chop the aubergine and peppers into large chunks (around 4cm) and peel and chop the potatoes into chunks of a similar size. Slice the chillis thinly and chop the onion finely. 3. Toss the aubergine and pepper in a bowl with 2 tsp of olive oil and then tip onto a baking tray. Pop into the oven to roast for 20-25 mins or until it's beginning to brown. 4. Pan fry the onion and green chilli in 1 tsp of olive oil with the cumin seeds, chilli powder, garlic, paprika and ginger, starting on a high heat. Once you've heard the cumin seeds popping, turn down the heat to medium until the onion is well softened. 5. Add the tomato puree and tinned tomatoes and stir through. Then add the potato chunks. 6. Pour the boiling water in and stir well. Leave to simmer for around 10-12 minutes and cook the potatoes through. 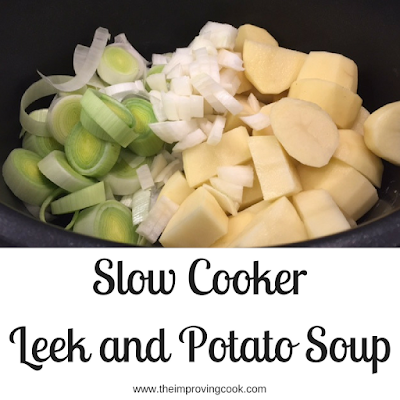 If the liquid reduces and the potato needs more time, add a little more. 7. Once the potatoes are cooked, add the roasted veg and stir through. Leave to reduce a little more if there's still too much liquid. 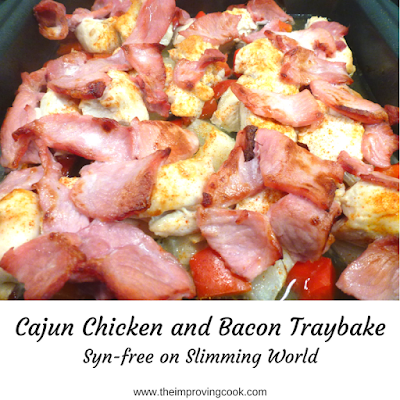 Syn free on Slimming World if you use spray oil. For less heat in the curry, either leave out the hot chilli powder or reduce to one green chilli, or do both, depending on your preference.